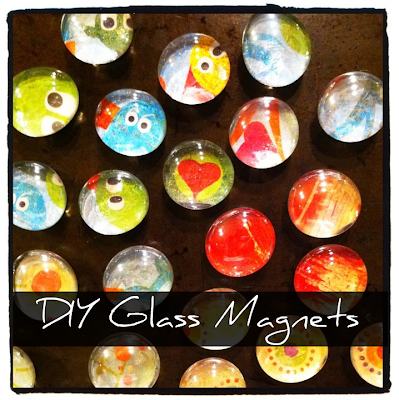 I saw these adorable, couldn't-be-easier-to-make magnet ornaments at Young House Love here. I enjoy reading YHL. The couple who makes up YHL is silly, creative and oh-so-productive. Three of my favorite descriptors. Lil O and I made our own magnet ornaments. We didn't follow YHL and use Liquid Nails to glue our magnets. But, instead, we used our trusty hot glue gun. This project cannot be any easier. In fact, it may go down as the fastest craft completed ever. Which isn't a bad thing. Especially when Mr. UpCyclist is on me to finish my craft projects as many of them are a "work-in-progress" - like for several years a work-in-progress. Here are the supplies: Glue gun ($2.99); we purchased ours from Joann's. Surprisingly, the mini glue gun sticks are more costly than I always imagine. Not break-the-bank-costly, but about $7-9 a bag. Go figure. This is Lil O's new glue gun. I've had my glue gun for years and it looks sticky and glorious. Ha! Magnets: I bought these for $3 at Michael's with my 50% off coupon (they were originally $6). They are a bit chubby, but strong. 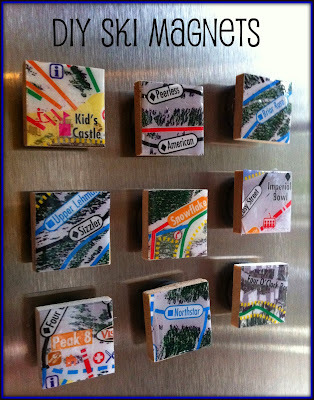 Plus, I absolutely love having extra magnets at home for other craft projects (see photos and links at the end). I bought these 50% off ornaments at Michael's. Lil O loves disco balls and dancing, so I knew she would adore these. The colors are energizing, too. 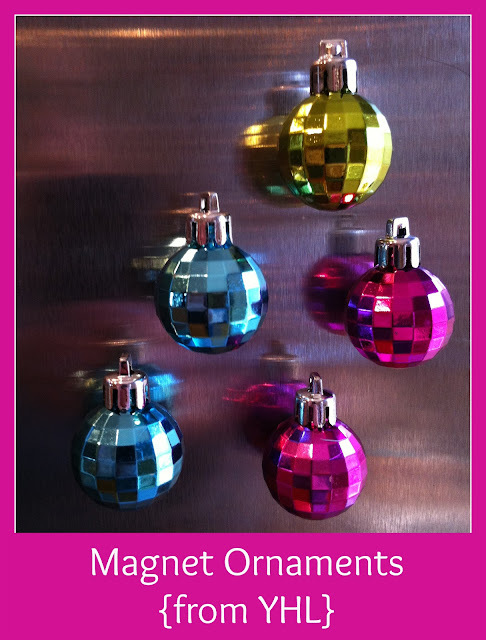 To make the magnet ornaments, all you have to do is open the packages (no, duh!?) and hot glue the magnets to the back of each ornament. Hot glue dries within seconds. So, the magnets were ready for their fridge debut within a minute. And even with slamming the fridge door, they haven't fallen off yet. Thanks, Young House Love, for the idea. It feels soooooo good to get back to crafting lately after a nationwide stressful week. Did you see yesterday's post about DIY Chalkboard Ornaments? That's another easy craft, too. Again, crafting fuels my soul.